Russell Kridel, MD was a featured faculty member at the recent 14th International Course on Facial Plastic Surgery & Rhinology in Bogota, Colombia. As an internationally recognized leader on Rhinoplasty and Facelift surgical techniques, Dr. Kridel was invited to share his expertise with other surgeons attending the meeting. Dr. Kridel was invited to discuss several surgical techniques he pioneered to an audience of multi-specialty surgeons attending the course from around the world. 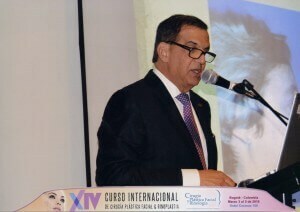 He presented numerous master level courses, including three courses on Rhinoplasty ---"Top Modifications in Rhinoplasty: Increasing Definition and Projection", "Tip Modifications in Rhinoplasty: Deprojection and Improving Columellar Disproporation", and "Lessons Learned in 30 Years of Rhinoplasty." Dr. Kridel also presented two courses on progressive face lift approaches. "Simplifying Facelifts" gave attendees new insight into planning facelift surgery for the greatest efficiency and patient success. While his talk on "Adjuncts in Facial Rejuvenation (blepharoplasty, forehead lifting, facial implants, laser surgery)", helped provide physicians with the tools of looking at how other surgical procedures combined with facelift can provide the most optimal result to meet a patient's true aesthetic goal. "It is a pleasure to speak to so many talented surgeons. Sharing advanced techniques in this type of course environment benefits patients across the globe, "confirmed Dr. Kridel. The well respected course in Bogota, was designed to enhance participant’s understanding of facial plastic surgery approaches for contemporary correction. The international, multi-specialty faculty represented the highest standards of intellectual inquiry and surgical mastery. As an internationally recognized expert on Rhinoplasty and Facial Rejuvenation, Dr. Russell Kridel is often invited to speak at medical conferences to share his surgical expertise with other surgeons looking to improve their skills. He is referred to as “The Doctor's Doctor,” by his peers because they entrust their family' and their own facial plastic surgical needs to Dr. Kridel because of the depth of his surgical expertise exemplified by the highest surgical awards and honors as well as the volumes of scientific publications he has authored or co-authored on facial plastic surgery. There is no other facial plastic surgeon in Houston that has the same level of expertise and respect in regard to Rhinoplasty, Revision Rhinoplasty, and Facelift surgery. To make an appointment for a Rhinoplasty or Facelift consultation with Dr.Russell Kridel, contact Facial Plastic Surgery Associates at 713/526-5665.